Doors Opening and Closing, an Analogy for Calcium Channels: Carrie Newcomer sings “When one door closes another door opens wide/It’s hard to believe all of the locked doors I’ve tried.” Each cell in our body requires nutrition and substances that deliver signals. One such substance is calcium, a 2+ charged metal ion (like the Ion TV network slogan it is “positively” entertaining). Calcium uses cell-membrane-anchored channels to be transported from outside to inside the cell. Ion channels exist to selectively allow calcium the pathway into a cell. Once inside the cell, calcium helps to promote muscle contraction, neurotransmission (signaling molecules released by a neuron and bind to and activate the receptors of another neuron), gene expression, and other types of actions known as signaling. Therefore, when calcium is transported through a calcium-ion-channel, a whole series of cellular events are initiated, like a key-turning in a lock and opening a door. There are several different types of calcium-specific ion channels. For many years, physicians have used drugs that ‘block’ calcium channels to treat different diseases. “Calcium channel blockers prevent calcium from entering cells of the heart and blood vessel walls, resulting in lower blood pressure. Calcium channel blockers, also called calcium antagonists, relax and widen blood vessels by affecting the muscle cells in the arterial walls. Some calcium channel blockers have the added benefit of slowing your heart rate, which can further reduce blood pressure, relieve chest pain (angina) and control an irregular heartbeat.” (http://www.mayoclinic.org/diseases-conditions/high-blood-pressure/in-depth/calcium-channel-blockers/art-20047605). A generic picture of a calcium channel blocker interacting with a calcium ion channel is shown below (modified from http://en.wikipedia.org/wiki/Calcium_channel_blocker): “And Now For Something Completely Different” (Monty Python): Maybe you’re thinking ‘What do calcium channel blocker (CCB) drugs have to do with Parkinson’s?’ In fact, my Neurologist and I have discussed this topic several times. I offer the following as a possible explanation. #2. Autopsy Evidence. Scientists have speculated that excess cellular calcium could promote neuronal cell death. To test this hypothesis, Hurley and others compared the brains of patients who died of Parkinson’s compared to brains from people who died without neurological disease. The types of calcium channels in the brains of those with Parkinson’s had a different pattern from the brains of those without neurological disease, in particular a calcium channel called Cav1.3. 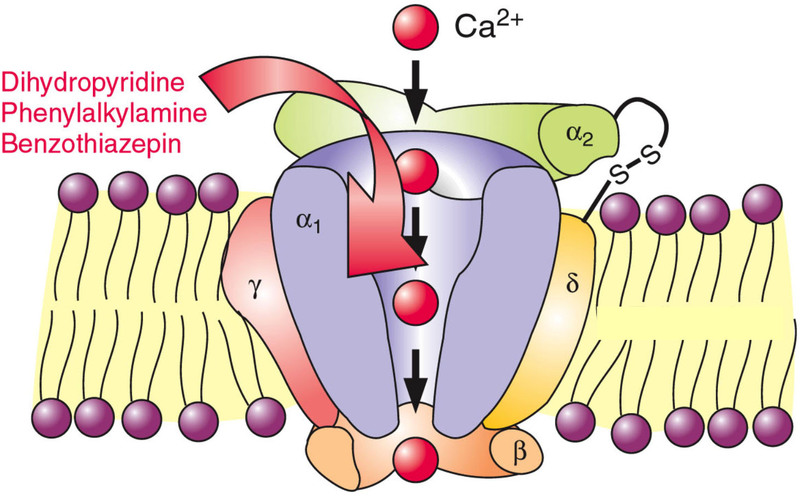 They speculated that increased calcium transport, through these calcium channels, in dopamine-producing cells could cause cell damage leading to cell death [See Hurley MJ, Brandon B, Gentleman SM, Dexter DT (2013) Parkinson’s disease is associated with altered expression of CaV1 channels and calcium-binding proteins. Brain 136:2077–2097 http://dx.doi.org/10.1093/brain/awt134 and http://www.pdf.org/en/science_news/release/pr_1373985871 ]. #3. Clinical Trials. Dr. Surmeier started this whole area of research when he reported that over-active calcium channels could stress and potentially kill dopamine-producing cells. An FDA-approved CCB named Isradipine has gained momentum in Parkinson’s research. The hypothesis is that a blood brain barrier-penetrating CCB might be able to block calcium channels and preserve dopamine-making cells. Dr. Simuni has recently shown in clinical trials (Phase II) that Isradipine is safe to use in patients with Parkinson’s (https://www.michaeljfox.org/foundation/grant-detail.php?grant_id=486 ). Now the attention turns to a much larger and longer NIH-funded study, a Phase III clinical trial. The goal is to determine if Isradipine can slow the progression of the disease by keeping the brain’s dopamine-producing cells healthy (http://www.urmc.rochester.edu/news/story/index.cfm?id=4042 ). #1 + #2 + #3 = Hope. We treat and manage our symptoms; currently, there is no cure for Parkinson’s. When I re-read the work behind Isradipine, I remain hopeful that it has a chance to work. Isradipine (CCB) may be a key to shut the door (calcium ion channel) on dopamine-producing cells to slow the progression of Parkinson’s. Medical research is about asking and then answering relevant (and important) questions. When one door closes another door opens wide, thus, I believe we are getting closer to finding treatment strategies for slowing the progression of Parkinson’s. STEADY-PD III (isradipine) clinical trial results will be released at the 2019 American Academy of Neurology meeting in Philadephia on the 4th-10th May, 2019.